Tunnel of Lava! is a single-player Bowser minigame found in Mario Party 7. Its name is a pun on the carnival ride "Tunnel of Love". A Mechakoopa eats a key, then runs off into a door. Then, a large group of Mechakoopas emerges from that area. The player must jump on Mechakoopas and try to find the one that swallowed the Key. However, the Mechakoopas constantly rotate in a circle and move in and out. Occasionally, their eyes will glow, and they will breathe fire. Touching the flame or a Mechakoopa will stun the player temporarily. If the player successfully finds the correct Mechakoopa within 30 seconds, they avoid Bowser's penalty. Rules – "Only one of Bowser's minions has the precious door keey. Stop on them to find it." Advice – "Needless to say, fire is really, really painful. Avoid the critters when they are belching flame." Spanish ¿Donde está la llave? Where is the key? 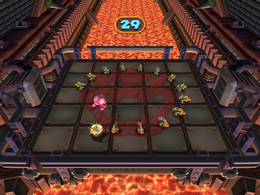 The name of this game describes the location as opposed to the gameplay, despite the fact that all of the single-player Bowser minigames were in the same location. This page was last edited on November 29, 2017, at 12:24.